The holidays are here, and everyone has the same question: Who do I have to buy gifts for this year? Gift giving etiquette is never easy. You want to be generous and give to everyone, but let’s face it, that’s just not realistic. You have to draw the line somewhere, otherwise you’ll not only break the bank, but you’ll drive yourself crazy. Here are a few tips on how to make it not only easy on yourself when it comes to gifts, but how to also make it easy on those who are buying for you and your family. Make a list; check it twice. Maintain a list of the people you buy gifts for every year. Use a spreadsheet so you can track what you bought and how much you spend every year on each person. In addition to your family, don’t forget your hairdresser, housekeeper, nanny, doorman, garage attendant, secretary, teachers and postal carrier. This will ensure you don’t forget anyone and you have an idea of your budget. Keep a supply of hostess gifts and gift wrap handy. A bottle of wine is always appropriate and can be put in a pretty bag in seconds. Give the same gift. If you have a great gift idea, give it to as many people on the list as possible. Originality is overrated. 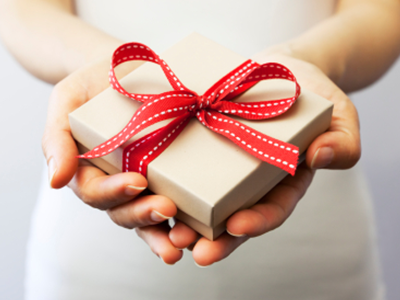 Consider organizing a Secret Santa or grab bag with set limits for the price of the gifts. It’s infinitely easier on your budget and time to shop for one person than a whole family or office. Make it easy on others. Be prepared with suggestions when someone asks what you or your kids want as gifts. If you’re at a loss, ask for a gift card. Return the favor and give gift cards whenever possible. Barbara Reich formed Resourceful Consultants, LLC in 1999. She and her husband live in Manhattan with their twins. Barbara has appeared on the Today show and has been featured in The New York Times, New York Post, and Real Simple, among other publications.